In 1985, the World Bank gave a loan of us $350 million to the Sardar Sarovar Project. There was an immediate outcry: civil-society groups protested the grant, saying the project would displace thousands of people. The government offered a resettlement package for those threatened with displacement but it was too late: the efforts of the protestors and international pressure led the World Bank to withdraw the grant. That was a momentous occasion in water politics in the country. The struggle against the project continues, attracting much scholarship, including a critically acclaimed monograph by the editor of the volume under review. Waterscapes: the Cultural Politics of a Natural Resource, however, does not mention this struggle. The omission seems deliberate: part of a considered approach by the editor to avoid well-trodden paths. Each of the 15 articles in the collection takes us into unexplored areas. The focus is on the Third World, but none of the contributors lose sight of the context of a globalizing economy. As Amita Baviskar points out in her introduction, "In the political economy of water, the global and the local dissolve into each other, creating conjunctures that are similar yet distinct." With contributions from historians, sociologists and anthropologists, this volume offers a remarkably nuanced understanding of water politics. It does so by going beyond a narrow political ecology approach. 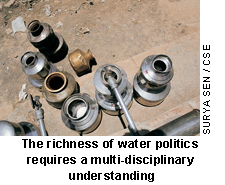 Each contributor is alive not just to the finer points of water policy, but also to the significance of historical research in understanding contemporary politics. Waterscapes engages with a diversity of concerns ranging from international aid to the limits of local initiatives. The first section, 'The Politics of Creating and Regulating Scarcity', deals with issues as wide-ranging as the local politics of groundwater in Gujarat to the impact of large-scale industrial systems in western India. The second section, 'Imagining Communities', an appellation drawn from Benedict Anderson's book of the same name, takes a critical look at community management as an alternative to state control. The final section, 'State Projects and Water-scapes', examines tensions underlying efforts to harvest water resources. Some essays stand out. Among them is Baviskar's The Dream Machine: the Model Development Project and the Remaking of the State. Through a careful study of local politics and culture, Baviskar shows how the state and funding bodies have undermined local initiatives, even while trying to naturalize newly created institutions. The essay shows the ambivalence between the rhetoric of community participation in decision-making around water and the imposition of state rationality in water management. Another essay worth a mention is David Mosse's Ecology, Uncertainty and Memory: Imagining A Pre-colonial Irri-gated Landscape in South India. The author shows the fallacy of the still-persistent notion of rural India as a self-contained entity. Mosse shows how such notions were historically constructed. In a similar vein is Donald W Attwood's Small is Deadly, Big is Wasteful: The Impact of Large Scale Industrial Systems in Western India. The essay is a critique of the romantic notion of a pre-colonial past marked by social harmony and ecological sensitivity. He shows that such views obscure the perils of living in isolated pockets. His is an argument that a lot of our environmentalists would do well to pay heed to. Many might still disagree. But they wouldn't at least dispute the sparkling prose of many of the contributors to this volume. Some of them border on the lyrical. Amongst them is Hugh Raffles' essay, Fluvial Intimacies on trade in the Amazonian basin that seems inspired by Gaston Bachelord's classic Water and Dreams. The research invested in this book is not merely a scholarly achievement. There is much political significance to it. The Third World has been regarded either as an inarticulate entity in global environmental matters or as the locale of an ahistorical rural idealism. These myths are often mobilized in contemporary debates around environmental issues. Waterscapes goes a long way in busting them.